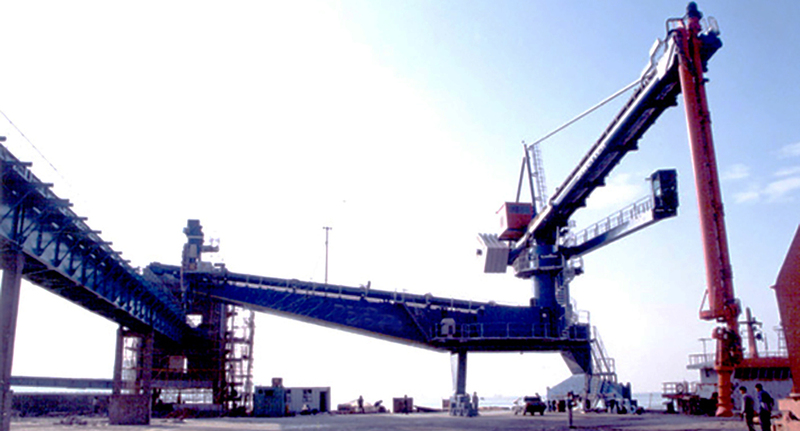 A Siwertell ship unloader in combination with horizontal and vertical screw conveyors as well as aeroslides were installed at Ma Wan Port, as part of a new cement terminal for Shenzhen Haixing Onoda. The continuous, screw-type Siwertell ship unloader, with a totally enclosed conveying system, is provided with a reach extender, which is an extra knuckle on the vertical conveyor for optimum reach in the ship’s cargo hold. With a 25m overhang design, the unloader fulfils the customer’s requirement to keep the quay free for vehicles. The reclaiming conveying system is based on horizontal and vertical screw conveyors, as well as aeroslides. Four silos in total are connected to the system. From each silo outlet the cement is moved in a horizontal conveyor to an aeroslide. The aeroslide feeds a vertical conveyor that elevates the material 37m for further transportation to a packing-/lorry loading plant. Dust collectors are included in the conveying system to minimise leakage of dust.